Find hotel near Military Museum Of The Ch ..
Military Museum of the Chinese People’s Revolution was constructed in the year 1959 to celebrate the tenth anniversary for the founding of the People’s Republic of China. The destination occupies a massive space of 93,700 square meters and is a historically important building in the destination. The main building is about 94.7 meters (about 310 feet) tall and has 7 floors. Visit the destination and get to see relics and artefacts that will blow you away. Also, visit the popular attractions in the city by following Beijing itinerary 4 days. The maximum number of visitors is 30,000 per day, so if you want to enjoy it, you should arrive early. Take care to leave your baggage in the allocated areas before entering it. Admission is free but you must show your identification card or passport to get a ticket. Last entry is upto 04.00 pm. Very big space for huge airplanes and even two rockets. Sadly the top floors was closed, from the distance you can see they keep the guns there. In the cellar there are vehicles. A lot of them from all over the world. Easily accessible from subway of the same name. High security all around. Will need passport or ID card to gain entry. But worth a visit, not least because entry is free. 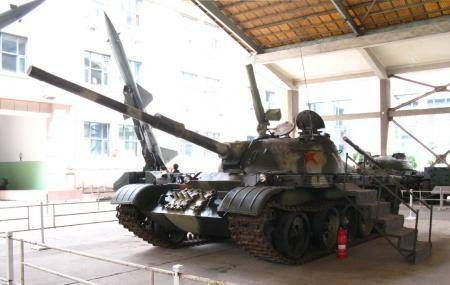 Huge collection of guns, tanks and other military equipment seized from the Japanese, the Kuomintang and the Korean War. Very good museum. Entrance is free (bring a passport/ID). It's quite easy to find as it has its own subway station. The exhibitions and the artifacts shown are of high quality. Unfortunately most text is Chinese only. But well worth a visit. The upper gallery was closed (small arms, uniforms). Don't miss the artillery/tanks in the basement. Very well organise museum. No entrance fee but very tight security. It will be good if they have English translated sign or guide available. Those can't read Chinese will not be able to appreciate/enjoy so much.